Today we will learn about Babcock and Wilcox boiler. Babcock and Wilcox boiler is a natural circulation, externally fired medium pressure, stationary horizontal water tube boiler in which water is flow in the inclined tubes. The furnace is located outside of the drum. 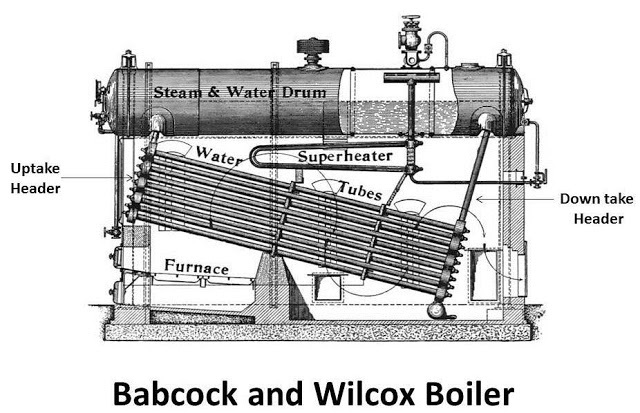 Babcock and Wilcox is a stationary water tube boiler. It has inclined tubes which are inclined at 10 to 15 degree, which are inclined to maintain natural circulation of water from drum to tubes and steam from tubes to drum. The main parts of this boiler are as follow. This drum is situated upside of the boiler. It is larger diameter drum in which water and steam placed together. The one half of the drum is filled with water and the other half is remaining for steam. Water tubes are situated bottom side of the drum. Water flows from the drum to the tubes. Steam separator drum and water tubes are connected by the two tubes. One is known as uptake header and the other one is known as down take header. The steam from the water tubes to the drum flow by the uptake header. The water flows form the drum to the water tubes through down take header. When the steam flows by uptake header to the drum, at the same time water flows from drum to the water tubes by down take header which maintains the flow of water. The place in the furnace, where the fuel is placed and burn known as grate. The furnace is the place where the fuel burns. This is situated at the down side of the water tubes. When the fuel burns, the flue gases generate. This gases flow upper side and passes through water tube, which heat the water and convert it into steam. Super heater is situated upper side of the water tube. One end of super heater is connected to the drum and other end is for process work. Steam flows from the drum to the super heater, where it heated by the flue gases and send for the process work. Baffles are provided between the water tubes. The main function of baffles is to divert the flue gases, so it flows more than one time through the tube and more heat is transfer. Other mounting like safety valve, blow off valve, fuel door, inspection door, mud box, feed valve, stop valve, pressure gauge etc. are also provided for safely working of boiler. Now we discuss about working of Babcock and Wilcox boiler. This is a high pressure, natural circulate, water tube boiler. The working of this boiler is as follow. * First water is filled in the water drum through feed pump. The drum is half filled with water and the upper half is for steam. First flue is fired at the grate. * The flue gases generate by burning of fuel. These gases start flowing from one end to another end of boiler. * The flue gases passes by the water tubes and exchange heat with water. The baffles are provided in the way, which deflects the flue gases before escaping from the chimney. Due to this deflection, the flue gases pass more than one time through water tubes, which cause more heat transfer. * The water flows from the drum to the water tube through down take header. * The water tube nearer to the furnace heated more than the other, so the density of water decrease in this tube which causes the flow of steam from tube to drum through uptake header. At the same time the water from the drum enters into the tubes through down take header. * The circulation of water from drum to tubes and again tubes to drum is natural, due to density difference. * The steam separates in the drum at the upper half. This is saturated steam. This steam sends to the super heater through steam pipe. The steam is heated again by the flue gases in the super heater and taken out for process work. * The flue gases send to the atmosphere from the super heater. * This process repeat until sufficient amount of steam generates. This boiler can generate 20 ton steam per hour.For better understanding of working of Babcock and Wilcox boiler watch the video. 1. The steam generation rate is higher about 20 ton per hour at pressure 10 to 20 bars. 2. The tubes can be replaced easily. 3. The boiler can expand and contract freely. 4. It is easy to repair maintenance and cleaning. 5. It drought loss is low compared to other boiler. 6. The overall efficiency of this boiler is high. Today we have discussed about Babcock and Wilcox boiler. If you have any query, asks by commenting. If you like this article, don’t forget to share it on social networks. Subscribe our website for more informative article. Thanks for reading it. What is a boiler? What are parts of a boiler? Sir you are mentioned in the vedio, the water tuber are having inclination 15° . is there any reason for that ? And why dont you place more than 15° please tell me the answer.